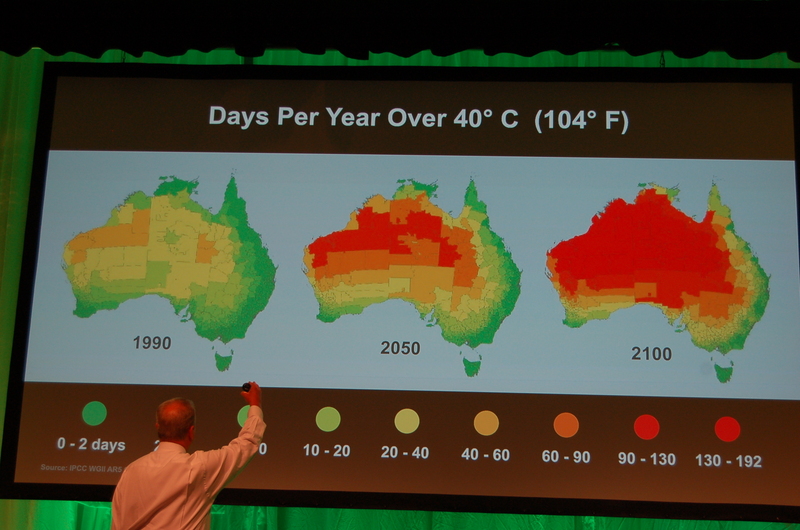 Al Gore presents the State of the Climate during the 25th Climate Reality Leadership Corps Training in Melbourne. Climate change is the greatest ecological, economic, and social challenge of our time. World scientific bodies have done peer-to-peer research that proves links between human activities and warming of the atmosphere and oceans. This warming caused changes to the climate system, such as changes in rain, wind patterns, and reductions in Arctic sea ice. In Australia, the Commonwealth Scientific and Industrial Research Organisation (CSIRO), is the nation’s science agency and is one of the largest and most diverse research agencies in the world. Climate change is an integral part of its flagship programs. Facts about climate change can be found here, including the most frequently asked questions. CSIRO has also released an eBook, Climate Change: Science and Solutions for Australia that provides the latest scientific knowledge (as at 2011) on a series of climate change topics relevant to Australia and the world. It draws on peer-reviewed literature contributed to by thousands of researchers. general public with an interest in climate change science. CSIRO also released the State of the Climate – 2014, the third in a series of reports it jointly produced with the Australian Bureau of Meteorology (subject to updates). The report provides a summary of observations of Australia’s climate and analysis of the factors that influence it. Australia faces significant environmental and economic impacts from climate change across a number of sectors, including water security, agriculture, coastal communities, and infrastructure. Leading scientists advise climate change will cause increases to the frequency and intensity of extreme weather events. Rising sea levels pose a significant risk to coastal communities, while the world’s oceans could become too acidic to support coral reefs and other calcifying marine organisms. Decisions made today about infrastructure, health, water management, agriculture, biodiversity and housing will have lasting consequences for future generations. The Australian Government is investing in programs such as the Australian Climate Change Science Program and the Natural Resource Management Climate Change Impacts and Adaptation Research Program to help decision-makers understand and manage likely climate change impacts. The IPCC is the leading international body for the assessment of climate change. It was established by the United Nations Environment Programme (UNEP) and the World Meteorological Organization (WMO) in 1988 to provide the world with a clear scientific view on the current state of knowledge in climate change and its potential environmental and socio-economic impacts. In the same year, the UN General Assembly endorsed the action by WMO and UNEP in jointly establishing the IPCC. The Fifth Assessment Report (AR5) has been release providing a clear and up to date view of the current state of scientific knowledge relevant to climate change. It consists of three Working Group (WG) reports and a Synthesis Report (SYR). More information here.